Original price (in year 1986) 295 roubles. PK7005. Prototype of the particular camera. Released in 1979, under name "Lomo-103". 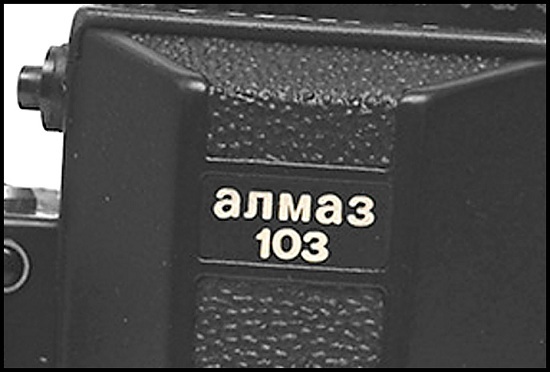 "Almaz-103" markings on the top. Camera without serial number, with contacts for motor drive attachment. No "LOMO" markings on the rear plate yet. Fitted with Volna 1.8/50 lens #790007. PK7005 - Almaz-103 prototype camera. PK7007. 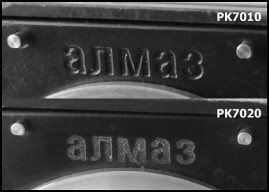 Prototype identical to PK7005, but with single "103" markings on the top (see picture below). 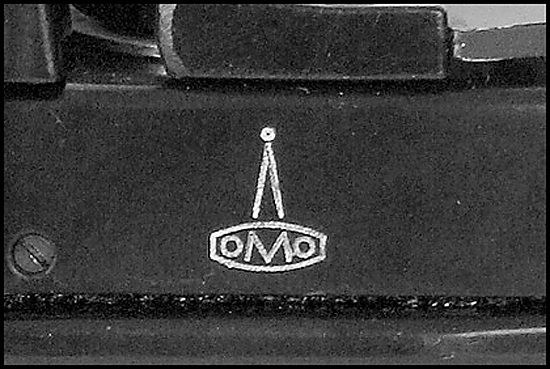 Big "LOMO" markings on the rear plate. 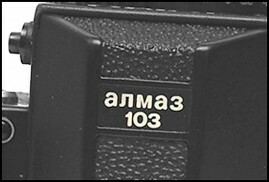 Serial number engraved inside the body. 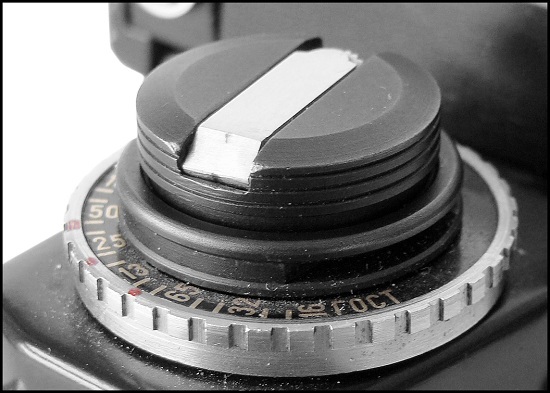 Lens fastening knob on the frontplate is more natty now. An only so far known camera has s/n #800087 (SovietCams). PK7010. Short-run preseries camera identical to PK7007, but under name "Almaz-103" already. 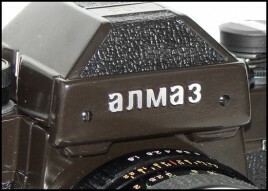 "Almaz" markings stamped on body above the lens already. 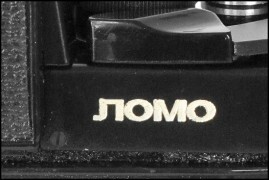 Still old style of film memo disk (see picture below). Less than 50 copies released in 1980. 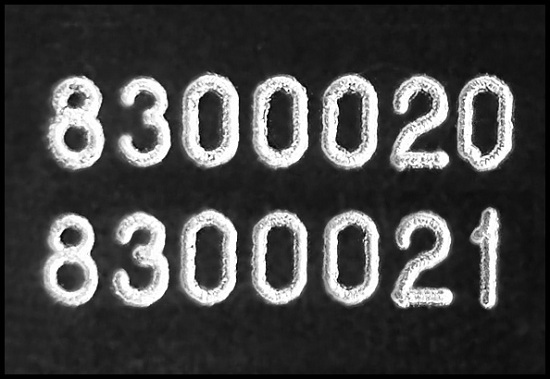 An earliest so far known camera has s/n #800035 (private coll.). PK7015. 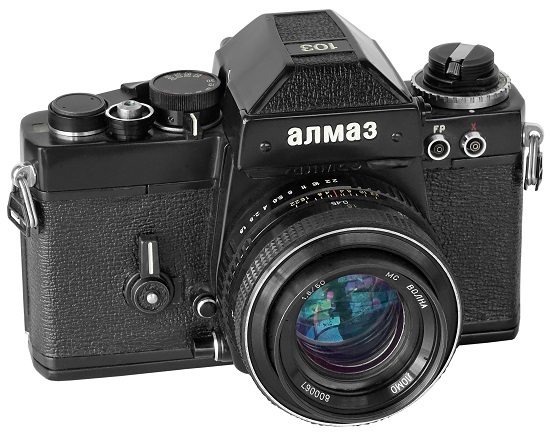 Very few cameras released in 1982. 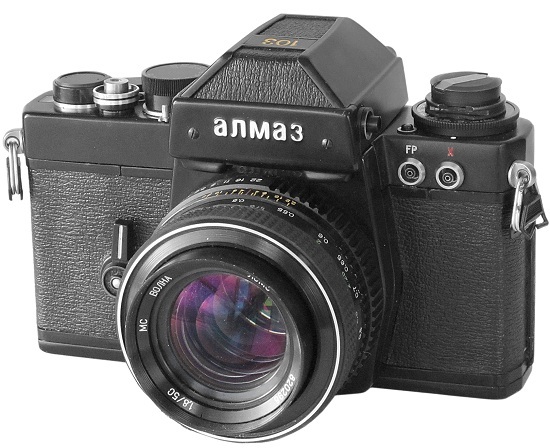 Seems to be the 1st productional version of Almaz-103 camera. 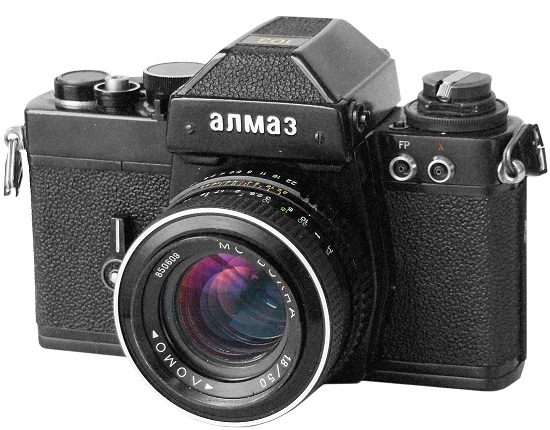 Less natty type in comparison with early Almaz-103 cameras. No more "Almaz" markings on body. Film memo disk is totally black now, changed design of the shutter release knob. 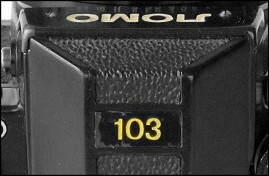 Yellow-white "LOMO" markings on the rear plate. 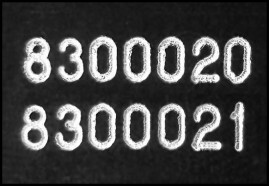 6-digits serial number. An earliest so far known camera has s/n #820006 (SovietCams). PK7017. 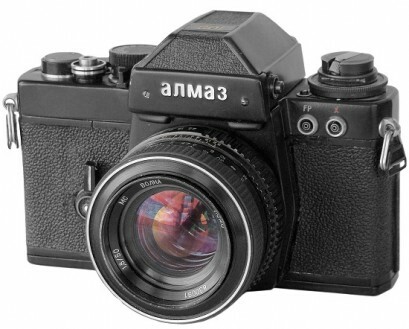 Camera identical to PK7015, but with 7-digits serial number already. Very limited quantity released in 1982. Without "Almaz" markings on body. 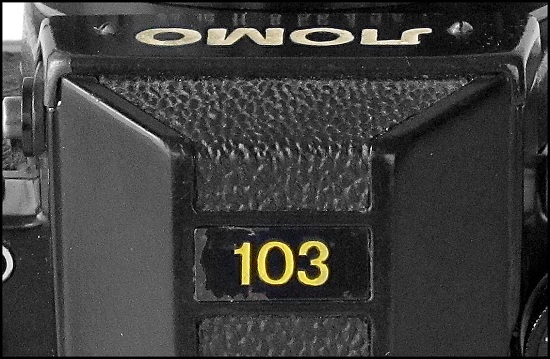 Yellow-white "LOMO" markings on the rear plate (see the picture below). 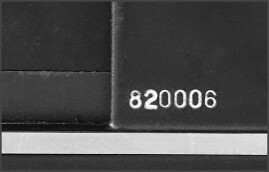 An earliest so far known camera has s/n #8200014 (private coll.). 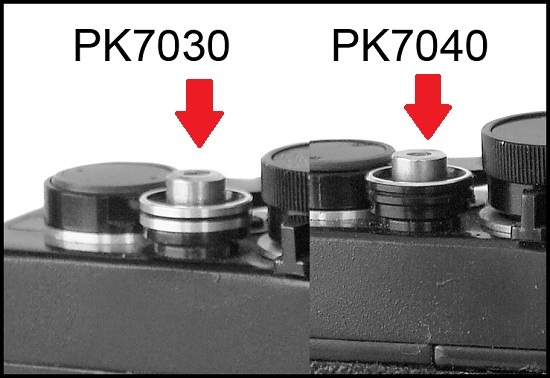 PK7020. Very few cameras released in 1982-1983. Less natty type again. Black film memo disk, changed design of the shutter release knob. 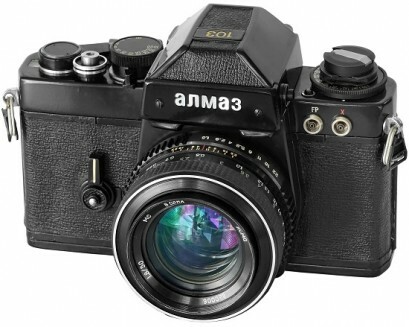 New style "Almaz" markings on camera's body again (see picture below). White "LOMO" markings on the rear plate. 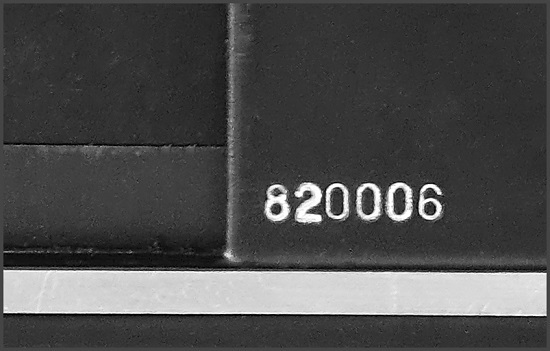 An earliest so far known camera has s/n #8200220 (private coll.). 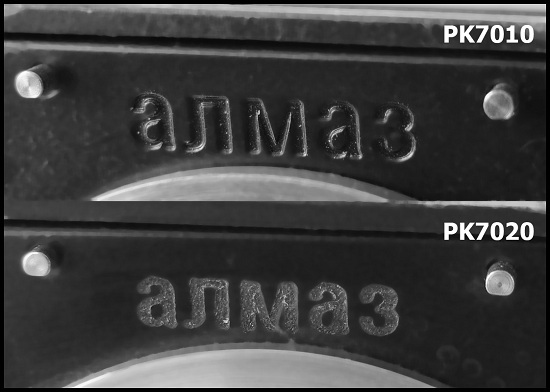 PK7025. 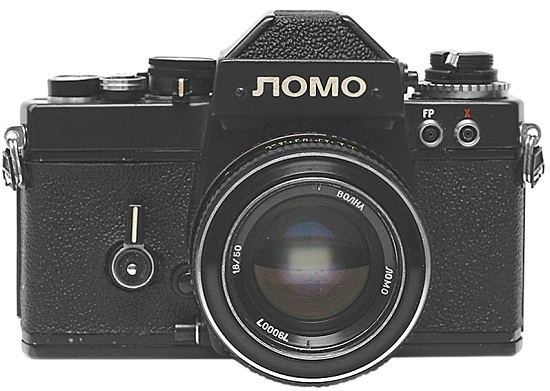 Camera identical to PK7015, but with regular "Lomo" logotype on the rear plate already. 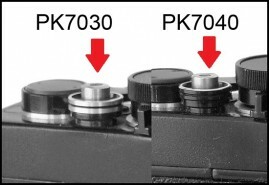 PK7040. 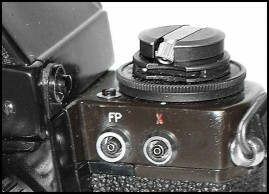 New design of shutter release knob (see picture below), big markings on the lens frontplate. 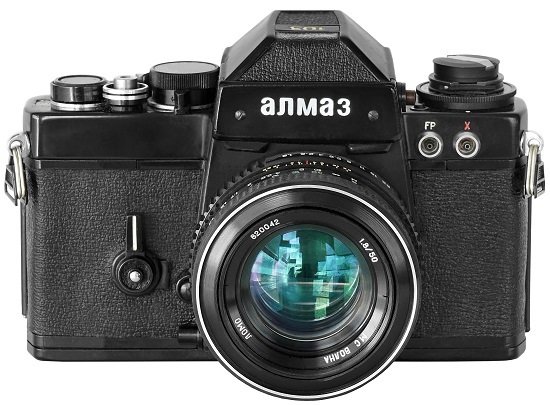 No more' "Almaz" markings on camera's body.No otherwise visually different. 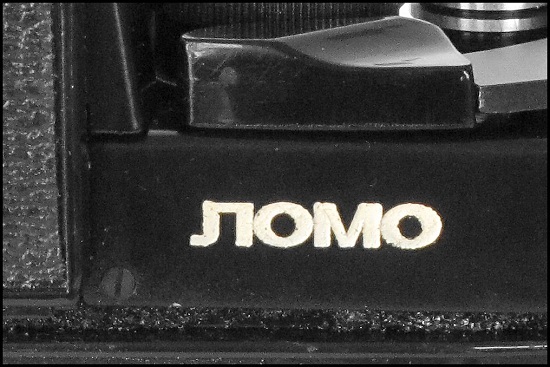 Regular "Lomo" logotype on the rear plate. PK7045. Camera identical to PK7040, but with both top plate and bottom plate, painted in special "Chameleon type" colour. Usually you need to use a flash to see this (see picture below). Seems to be the last type with 2 synchro contacts on body. PK7050. Seems to be the last version of Almaz-103 camera. Only one synchro contact on the frontplate. Special "Chameleon type" painting again, but now even prism and shutter housing is painted. The picture below was taken using built-in flash.